“Maternidad”, Picasso, 1905. Rose Period. “Guernica”, detail (madre e hijo / mother and child), Picasso, 1937. This maternal representation in Guernica is the result of numerous studies, and some art historians have interpreted the mother figure metaphorically as representative of certain political and national powers in times of war. The stylistic discrepancy between Picasso’s 1905 and 1937 portrayal of maternal devotion is fascinating from both personal and historical perspectives. Yet a contrast between these two samples alone does not adequately characterize Picasso’s treatment of maternal themes in the early 20th century, and in fact runs contrary to the more general trajectory identified by some scholars. Below are some examples of the treatment of maternity and motherhood in Picasso’s oeuvre. This is by no means a comprehensive analysis, but rather a “springboard” of sorts from which I have just begun to investigate the possible parallels between the literary themes I study and their appearance in contemporary artwork. “Maternidad” (Mother and Child), Picasso, 1901. “Madre e hijo” (Mother and child), Picasso, 1905. “Madre e hijo saltimbanquis” (Mother and Child Acrobats), Picasso, 1905. “Familia de acróbats con mono” (Family of acrobats with monkey), Picasso, 1905. Image via WahooArt. “Madre e hijo al borde del mar” (Mother and Child on the Seashore), Picasso, 1921. [Art Institute of Chicago]. Image via 20minutos. While the Pintado-Casas’ article and the observations of The Chicago Art Institute provide neatly organized, easily-identifiable categories, there are in fact several works that do not quite fit within these timelines. Here are a few more samples of Picasso’s paintings on “Maternidad” that defy, to some extent, that useful, but perhaps over-simplified, trajectory of the evolution of this theme his work. “Maternity en el campo” (Mother and Child in the countryside), Picasso, 1901. What are your favorite pieces of art depicting motherhood, maternity, and/or mothers and their children? What other versions of Picasso’s numerous takes on the subject do you prefer? Payne, Laura. Essential Picasso. Introduction by Dr. Julia Kelly. Bath, UK: Dempsey Parr; Parragon, 2000. Pintado-Casas, Pablo. “La representación de lo materno en Pablo Picasso y Soledad Puértolas.” Letras Femeninas 31.1 (2005): 107-115. [JSTOR: http://www.jstor.org/stable/23021520]. Wischnitzer, Rachel. “Picasso’s ‘Guernica’. A Matter of Metaphor.” Artibus et Historiae 6.12 (1985): 153-72. This entry was posted in Art, Spain, Women and tagged 1920s, art, art history, books, femininity, maternity, Mother and Child, mother-child relationship, motherhood, Pablo Picasso, picasso, Spain, spanish art, women. Bookmark the permalink. I really like Picasso, but I’ve never seen some of these. Very cool. 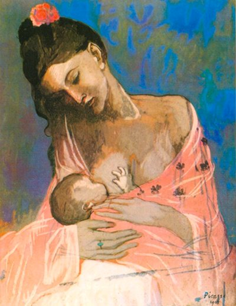 Do you know where the original is of “Maternidad”, Picasso (1905) at the top of the page? I would be in heaven to see this in person.